Home / News / Politics / UP lawyer rebuts Robredo’s lawyer: Bakit 'di nyo pinasasagot si Leni? UP lawyer rebuts Robredo’s lawyer: Bakit 'di nyo pinasasagot si Leni? Atty. Trixie Cruz-Angeles, a blogger and a supporter of President Rodrigo Duterte in her Facebook page, answered the lawyer of Vice President Leni Robredo, Barry Gutierrez, after the latter criticized Duterte. Gutierrez in his Twitter account said, "Inflation: 5.2%. Bigas: ₱42/kilo. $1 = ₱53.51. Dagdag sa pambansang utang: ₱1.19T. Sariling karagatan: bawal sa Pinoy. Trapik: palala pa. Patayan, tila araw araw na lang. Incompetent? Nagsalita ang magaling." Duterte and Robredo has had a feud ever since the VP started to question his policies. Cruz-Angeles then tackled the criticisms of Gutierrez and said, "Inflation is 5.2 because BuildBuildBuild. What has Leni done, except TravelTravelTravel? Bigas P42/k? NFA rice at P27/kilo, $1 = P53.1? Gurl, kasalanan ni Duterte lumakas ang dollar? Due to interest rate increases sa US Federal Reserve yan, Sariling karagatan bawal sa Pinoy? Sino nagpamigay ng Scarborough? Kamusta na kaya si Sonny T?" "Traffic, palala pa? Sabi ni dating PNoy sign of progress yan! Patayan, araw araw na lang? 70 thousand murders and homicides during PNoy's term. You want to lump all deaths together without going into causes Nagsalita ang magaling? Hindi. Nagsalita ang 16million,And finally, bakit di nyo pinasasagot si Leni?" Indeed, the Vice President has remained silent despite the tirades thrown at her by her superior. 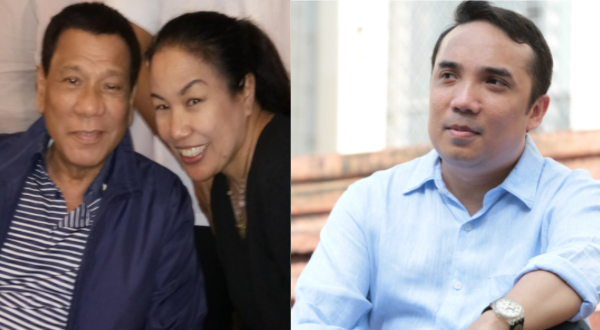 Gutierrez not only serves as the VP’s lawyer, he was also an active campaign supporter when she ran alongside Liberal Party’s Presidential candidate, Mar Roxas in the 2016 elections. Likewise, Cuz-Angeles, also a lawyer, has supported Duterte ever since his campaign in 2016. "Inflation is 5.2 because BuildBuildBuild. What has Leni done, except TravelTravelTravel? $1 = P53.1? Gurl, kasalanan ni Duterte lumakas ang dollar? Due to interest rate increases sa US Federal Reserve yan. Sariling karagatan bawal sa Pinoy? Sino nagpamigay ng Scarborough? Kamusta na kaya si Sonny T? Traffic, palala pa? Sabi ni dating PNoy sign of progress yan! Patayan, araw araw na lang? 70 thousand murders and homicides during PNoy's term. You want to lump all deaths together without going into causes? And finally, bakit di nyo pinasasagot si Leni?